Comments: Shade tree for large open spaces. One of the most attractive oaks. Long-lived (up to 600 years) and very desirable hardwood. 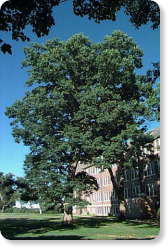 Large, deciduous tree, 60 to 80' tall (in urban conditions), as wide or wider than tall, pyramidal when young. Rounded, broad-rounded or upright rounded when mature. Branching is irregular and wide spreading; interesting. Plant in Full sun in deep, moist, rich, well-drained neutral to acidic soils.